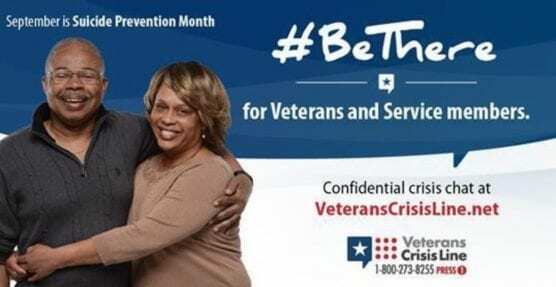 The U.S. Department of Veterans Affairs (VA) is shining a light on effective ways to prevent veteran suicide with its, “Be There,” campaign. The campaign highlights the risk factors and warning signs for suicide, provides information about VA mental health and suicide prevention resources, and helps individuals and organizations start the conversation around veteran mental health in their communities. Talking with a veteran about mental health or suicide risk may be challenging, but we encourage community leaders, colleagues, family and friends to simply “Be There” by sharing messages of support that can help show a veteran you care. The VA collaborated with community partners and is asking individuals across the country this month to share resources with Veterans via the BeThereForVeterans.com webpage. Veterans in crisis or having thoughts of suicide – and those who know a veteran in crisis – can call the Veterans Crisis Line for confidential support 24 hours a day, seven days a week, 365 days a year. Call 800-273-8255 and press 1. The next meeting of the Los Angeles County Board of Supervisors is set for Tuesday, April 23, starting at 9:30 a.m.